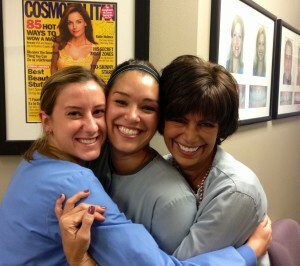 It is really obvious the staff at Jon Frankel Dentistry love what they do. The smiles, the laughter and the high standard of care reflect on something deeper. A vocation toward patient care and a commitment to spread the word that Healthy Mouths promote Healthy Bodies. Danielle was only 6 years old and she had a problem, eight cavities and no desire to sit in the dental chair for more than a few minutes. Once she settled in, she never left. Fascinated by the art and science and intrigued by the process Danielle was determined to become a Dental Hygienist. Several years later after graduating from our local Owens Community College with a double degree as a Dental Hygienist and an Expanded Function Dental Assistant she joined the team at Jon Frankel Dentistry. Lindsay knew she wanted a career in the medical field but did not want to wait. Her urgency was our gain. After thoroughly exploring all her options it was clear. Dental Hygiene offered exactly what she wanted and would not require a decade of study before seeing patients. She enjoys enhancing the overall health of patients by offering health education while working in a clinical setting. Mary Ann completed all her prerequisites for Nursing School and soon she realized it was not her ideal career choice. She wanted a profession that focused on disease prevention. Mid pregnancy with her first child she made a 180 degree turn and within no time she became a Dental Assistant/ Expanded Function Dental Assistant. Teaching patients about restoring their smiles and how to prevent disease are her favorite things to do. She finds dentistry an all-inclusive opportunity. Science, art, psychology and serving the public keep her busy, happy and excited to go to work each day.